A team of students from the University of New Brunswick Saint John campus pitching a concept for an intelligent highway are in the running for the top prize in a nation-wide transformational infrastructure competition. The business students vaulted into the top 20 of the CanInfra Challenge with their proposal for a smart highway design that feeds vital road, traffic and weather data to drivers, self-driving cars and road maintenance crews. They now must catapult themselves through the next round into the top 10, and are looking to amass support through 10 days of online voting that begins on March 29. Three of the teams to advance will do so having captured the most online votes while the remaining seven will be chosen by judges. 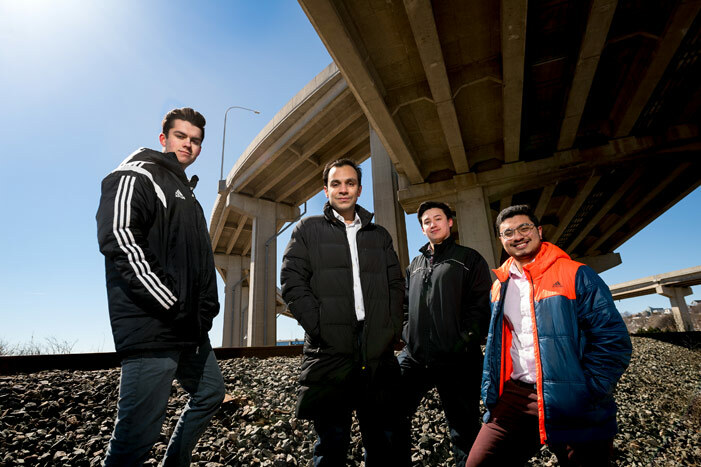 “We’re possibly the only student team from Atlantic Canada and definitely the youngest team in the competition,” says Nakul Gupta, a first-year business student and leader of the smart roads project. Since making it to the top 20, they’ve been working tirelessly to expand and refine their idea with help from the Boston Consulting Group, one of the companies sponsoring the competition. Mr. Gupta is joined by second-year science student Blake Constable along with first-year business students Prajain Raj Maskey and Peter Hopper, who were admittedly taken aback to make it to the top of a national competition dominated by teams with much more knowledge and expertise. They’ve taken their concept of a highway that only feeds data to autonomous vehicles and broadened it to the creation of an open, peer-to-peer data network that funnels key information required for both drivers and self-driving vehicles, including road hazards, traffic and hyperlocal weather. The goal is to make Canada a pioneer in smart highways that enable safe transportation by autonomous vehicles, to enable new high-tech businesses and to lessen the impact on the environment through more efficient commuting. Constance Van Horne, an assistant professor of management at UNB, made competing in the CanInfra Challenge a term project. The top 10 teams will receive $5,000 to further develop proposals and travel to Toronto to pitch their ideas in May. The top winner from the third and final round receives $50,000 and a pitch session with senior government and private-sector leaders while second place and people’s choice each receive $25,000. To see more details of their project and to vote online starting March 29, visit SmartRoads.ca. Photo: Students from the University of New Brunswick have proposed the idea of a smart highway design that feeds will send traffic, weather and road data to cars and maintenance crews as part of the CanInfra Challenge. From left: Blake Constable, Nakul Gupta, Peter Hopper and Prajain Raj Maskey. Credit: Joy Cummings / Photo UNB.